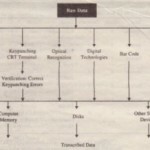 Transcribing data involves transferring the coded data from the questionnaires or coding sheets onto disks or directly into computers by keypunching or other means. If the data have been collected via computer-assisted telephone interviewing (CATI). computer-assisted personal interviewing (CAPI), or Internet surveys, this step is unnecessary because the data are entered directly into the computer as they are collected, Besides keypunching, the data can be transferred by using optical recognition. 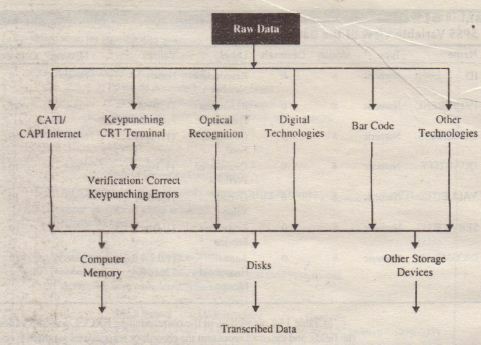 digital technologies, bar codes, or other technologies (Figure 14.4). process is optical mark recognition, where a spreadsheet type of interface is used to read and process forms created by users, These marked-sensed forms are then processed by optical scan and the data are stored in a computer file. Digital technology has resulted in computerized sensory analysis systems, which automate the data-collection process, The questions appear on a computerized grid pad, and responses are recorded directly into the computer using a sensing decide, Field interviewers use notebook computers, PDAs and other handheld devices to record responses. which are then sent via a built-in communication modem. wireless LAN. or cellular link directly to another computer in the field or a remote location. Bar codes involve direct machine reading of the codes and simultaneous transcription. A familiar example is the transcription of universal product code (UPC) data at supermarket checkout counters, Census 2000 used bar codes to identify residents, Companies like UPS and FedEx use bar codes on labels for expedited package shipments. Several other technologies may also be used to transcribe the data, Voice recognition and voice response systems can translate recorded voice responses into data files. For example, Microsoft XP software includes advanced speech recognition functions and can be used to transcribe data by speaking into a microphone. Newer technologies are being developed, We now have the capability to integrate visual images, streaming video, audio, and data that could well be used for recording a focus group or a survey interview. When CATI. CAPI, or electronic methods are used. data are verified as they are collected, In the case of inadmissible responses, the computer will prompt the interviewer or respondent. In case of admissible responses, the interviewer or the respondent can see the recorded response on the screen and verify it before proceeding. The selection of a data transcription method is guided by the type of interviewing method used and the availability of equipment. If CAT CAPI. 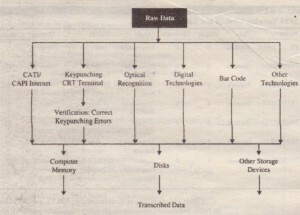 or electronic methods are used, the data are entered directly into the computer. Keypunching into a computer is most frequently used for ordinary telephone, in-home, mall intercept, and mail interviews, However the use of digital technology in personal interviews is growing with the increasing use of grid pads and handheld computers. Optical scanning can be used in structured and repetitive surveys, and optical mark recognition is used in special cases. Bar codes are used to collect scanner data and in a variety of other applications. A, of 2009. Princes, Cruises pan of Carnival Corporation. annually carried more than a million passengers, Princess wished to know”, hat passengers though of the cruise experience. but wanted to determine this information in a cost-effective way, A scan able questionnaire as developed that allowed’the cruise line to quickly transcribe the data from thousands of surveys. thus expediting data preparation and analysis, This questionnaire is distributed 10 measure customer satisfaction on all voyages. 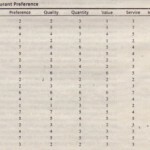 A monthly report cruise destination, and ship is produced, This report identifies any specific problems that have been noticed and steps are taken 10 make sure these problems arc addressed Recently these surveys have led to changes in the menu and the various buffets located around the ship.